Still from "Breaking Ground: The Story of the London Irish Women's Centre"
On Friday, July 12 you’ll have a wonderful alternative to the watching the endless lines of bowler-hatted Orange men parading to a big drumbeat on the Internet and on satellite news. If you’re in New York, why not pop down to the Irish Center in Long Island City, Queens to see a contrasting image of what’s possible when spirited Irish women decide to make a difference to their community. Breaking Ground: The Story of the London Irish Women's Centre , directed by Dublin-born artist and editor Michelle Deignan, is the absorbing tale of what happened when droves of suddenly displaced young Irish women began arriving in London in the hopes of making a new life for themselves. As the film shows, the biting recession of the eighties in Ireland compelled many of them to emigrate, but there were deeper privations at work too. The Catholic Church’s grip on the politics and culture of the nation, and in consequence on the daily lives and choices of Irish women, copper-fastened an oppression so pervasive it seemed impossible to dislodge. For many women London seemed to offer an opportunity to live a life free of clerical interference. It also offered a measure of economic independence from the often conservative and controlling expectations of Irish families. Whatever the allure was, there’s no doubt that throughout the eighties Irish women emigrated to London in their droves, and towards the end of the decade they made up an astonishing 10 percent of the capital's female population. Whatever was driving them out was working. In the past Irish county societies in London had offered new emigrants a necessary hand up. But this new generation of arriving Irish women found that the welcome had strings attached. In particular, they discovered that the attitudes and ways of life they had sought to escape were being faithfully replicated overseas. 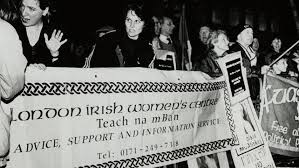 So in the end the creation of London Irish Women's Centre, a self-described radical organization located in Stoke Newington, provided thousands of Irish women with the community they were actually seeking throughout its long life from 1983 until 2012. But the center didn’t just exist to help the new arrivals. It also successfully sought to represent and support previous generations of Irish women in London. It insisted on doing this on its own terms of course, without clerical or government interference shaping or attempting to influence its agenda. By creating an alternative cultural and political space for women to be Irish, they found for the first time a place to discuss and make public the issues that were pertinent to both women in Ireland and Irish women in London. They didn’t do all this in a vacuum, the film shows. There was a strong and serious backdrop of anti-Irish racism to contend with from within the U.K. There was also pushback from the more conservative Irish community in London. But the center persevered and it began to carve out a new space for discussions to occur where previously there had only been silence. Chief among the grievances was the fact that Irish women were among the most disadvantaged ethnic and gender groups in terms of housing and employment. As the film shows, what the London Irish Women's Centre did was tackle all the inequalities and difficulties faced by Irish women in London, actively agitating for change and providing practical services to support Irish women to live daily lives along the way. Last year Deignan was approached by Claire Barry, the director of the London Irish Women’s Centre, to make a film about it. Deignan understood what a remarkable opportunity it represented and almost immediately said yes. Initially she planned to make a 30-minute film, but she discovered the source material, which included original videos of the conferences held by the group in the eighties and nineties, made it twice as long. “What we have now is a document of a real Irish success story in London,” says Deignan. They also confronted their own community’s expectations about how women should behave. The film starts at 7:30 p.m. Visit www.newyorkirishcenter.org for information.